The German Aerospace Center’s Airbus 320 sits “downfield” from a pair of NASA-operated sampling inlets that measure jet engine exhaust emissions. NASA’s ongoing research into the environmental effects of burning alternative fuels in jet engines picked up some fresh international flavor as it continued this fall in Germany. Working in collaboration with the German Aerospace Center, NASA’s aeronautical innovators supplied several key instruments for the DLR’s Emissions and Climate Impacts of Alternative Aviation Fuels experiments. Under this activity, NASA instruments are placed about 100 feet behind a parked DLR Airbus 320. 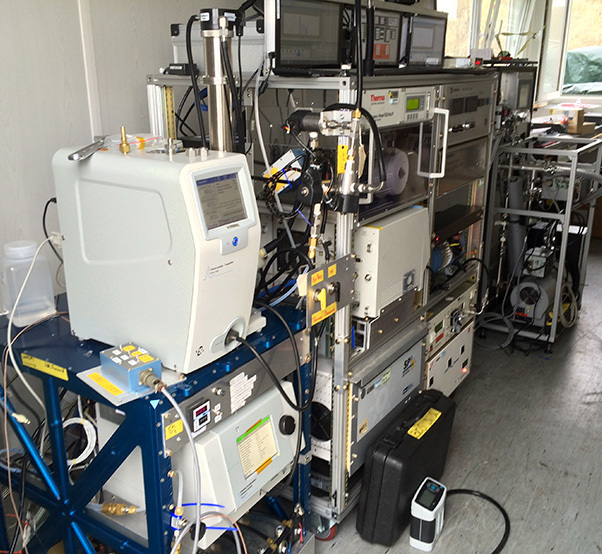 These instruments then measure the exhaust from the jet as it burns eight different types of standard and alternative fuels that contain varying amounts of aromatic compounds and sulfur impurities. 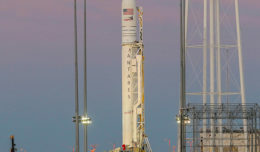 Emissions covering a total of about nine hours of ground-based jet engine operation will be sampled, data recorded and analyzed as part of NASA’s contribution to this German-led effort, said Bruce Anderson of NASA’s Langley Research Center in Virginia. “So far everything is going very well,” Anderson said. It is hoped research in this area will help lead to more environmentally friendly aircraft designs and worldwide flight operations, especially in light of the explosive growth in global air travel that is forecast for the decades ahead. ECLIF data will help confirm and supplement information gathered during NASA’s own research with the Alternative Aviation Fuel Experiment activities in 2009 and 2011, and then during the Alternative Fuel Effects on Contrails and Cruise Emissions activities in 2013 and 2014. 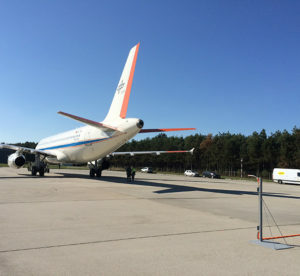 AAFEX was similar to what NASA is doing this season in Germany in that instruments were set up to measure exhaust coming from a combination of fuels being burned by a jet engine attached to NASA’s DC-8. ACCESS continued that research in the air, with instrumented research aircraft trailing behind the DC-8 not only to measure the exhaust chemical content from the various mixtures of alternative fuels, but also to study the emissions’ effects on the formation of contrails. So far the research indicates the alternative fuels result in a 50 percent reduction in soot emissions when burning blended fuel as opposed to traditional, petroleum-based jet fuel alone. During ACCESS II in 2014, an international sortie of aircraft participated in the airborne data gathering, including DLR’s Falcon 20-E5 jet. That same Falcon jet is being used for ECLIF, which includes both ground-based and airborne research. NASA’s contribution is for the ground-based research component. 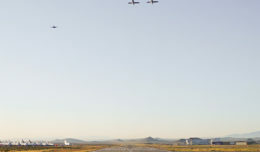 “The ground test data are being used to help interpret the flight data,” Anderson said. 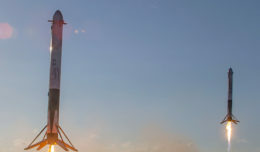 “On the ground, we are able to use a more extensive sensor suite to characterize exhaust composition over a much broader range of thrust settings and for greater lengths of time, which yields much better statistics for delineating differences in emissions between the fuels,” he added. Anderson also was invited to fly aboard the A320 to offer his expertise during airborne sampling. 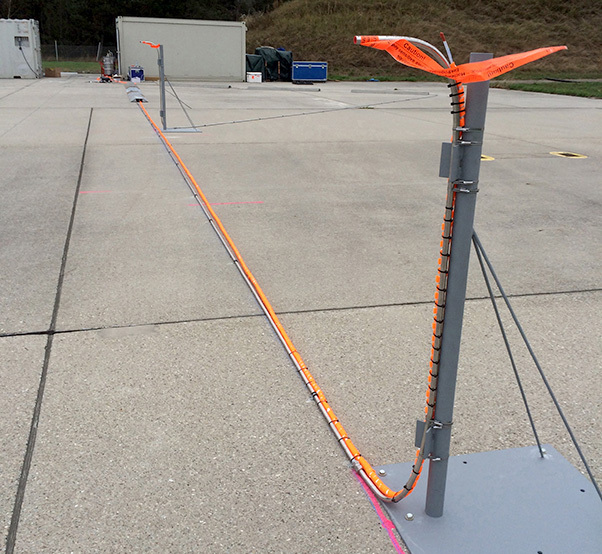 The NASA-designed and installed sampling inlets are set up on the airport ramp in Germany. “Our attendance and contributions were greatly appreciated,” Anderson said. Within NASA, the alternatives fuel studies is a joint effort involving researchers at Langley, Armstrong Flight Research Center at Edwards, Calif., and Glenn Research Center in Cleveland, Ohio. The research supports NASA aeronautics’ strategic vision, which has as a goal to enable the aviation industry’s transition to using low life-cycle carbon fuels and alternative propulsion systems.